The role of prayers in securing and maintaining your peace cannot be over-emphasized. A life without prayers is one full of troubles and that will soon be terminated. A prayerful person knows better not to play with his prayer time since experience has taught him that he rules over the devil on his knees. This post emphasizes the importance of prayer in maintaining your peace of mind. Prayer is a dialogue between you and God; you talk and listen to God. It is the fastest and cheapest way to conquer situations because you are relating with the creator of the universe. Prayer gets things done in the right way. It is the channel of involving God in the affairs of men, except you pray God can do nothing about that situation. When you pray, things happen! 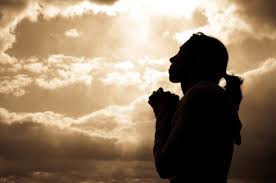 In 1 Thessalonians 5:17, as part of his last exhortations to the Thessalonians, Paul urged them to pray without ceasing, after which in verse 23 he prayed that the God of peace Himself would sanctify them completely. Prayer provokes the Prince of Peace to perfect all that concerns you. It is a must if you are to enjoy a peaceful life on earth. 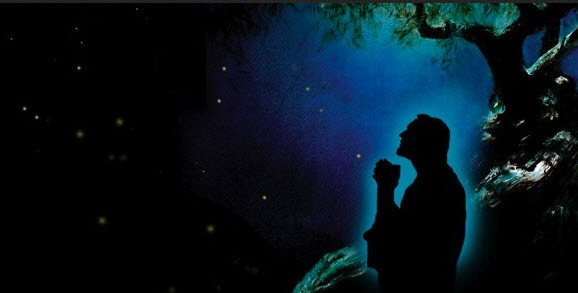 When the multitude from the chief priest and elders of the people came to arrest Jesus in the garden of Gethsemane (Matthew 26:47-56, John 18), Jesus was at peace because He had just come from praying. On the other hand Peter who didn't pray with Christ as He had requested, had no peace of mind and was making mistakes and taking the wrong steps throughout that day. First he cut off the servant of the high Priest's right ear and Christ rebuked him for it. And not long after that he denied his master, Jesus, whom he had earlier on said he would lay down his life for - John 13:37. So prayer settles your mind and equips you to pursue and conquer the businesses of the day. Whenever you have answers to the bugging questions in your mind peace sets in. And prayer being a channel of receiving these answers from the "all knowing God" is therefore very instrumental to your peace of mind. When you pray God speaks to you; that is why you shouldn't do all the talking and then rush out. You should wait and listen to hear God's reply to your prayer. Peter while praying got answers to the questions about Jews' conducts with the gentiles. So when he was faced with the issue of Cornelius he was at peace and when the Jews queried him about it, he boldly answered them without fearing what their response would be (Acts 10, 11:1-18). And many years after he still referred to the incidence to solve another problem - Acts 15:7. Faith is a sign that you have peace of mind over an issue. When you spend time communicating with God in prayer, you will discover that gradually you are building your confidence in God, His word and in yourself. You develop full trust in God's ability to help you and handle issues that are concerns to you. The word of God in Hebrews 10:35, tells us that our confidence carries a great recompense of reward, one of which I believe is peace; you will know and believe that that troubling case is settled forever. Paul having received answers from God concerning the raging storm in prayers had peace and was confident to announce to his ship mates that there would be no loss of life among them but only of the ship. He had full trust in God that it would be just as God told him - Acts 27:22-25. Your encounters with God in prayer give you confidence to face tomorrow, not just to pass through it but to conquer and subdue it. A consistent prayer life builds faith in God in you that leaves you perpetually at peace at all times. You get to trust God that anytime you call upon Him He would answer, so that even when the storm of life is raging you are calm and calculated. This was the story of Daniel. Daniel with death sentence over him and his friends boldly asked King Nebuchadnezzar for time, that he might give him the interpretation of his dream. He believed that all he needed was to pray to God for the interpretation of the dream and God would reveal it to him. He went into prayers with his friends seeking an interpretation of the king's dream from God and God revealed it to him. He then returned to the King with full assurance that he had the answer for the king and surely he had the answer; and not only were their lives spared, they were also promoted - Daniel 2:1-49. Prayer makes every crooked path straight. There are circumstances that are beyond our human comprehension and ability to solve but are no challenges at all to God. This is another reason why you need to pray. In prayer, you surrender these issues to God to handle for you. Yes, you work as if you have all the time in the world but then, you need to pray to God to ensure that you remain alive and victorious for each new day. There are forces of darkness whose sole work is to steal, kill and destroy, and it's only our Lord Jesus who has come to give you life in abundance - John 10:10. So, you need to ensure that every detail of your life is under Christ's care. If you consider any concern too minute to be prayed for then don't turn it into a burden later. It is through prayers that you engage God to make the crooked places straight for you and to break in pieces the gates of bronze and cut the bars of iron - Isaiah 45:2. When you secure God's intervention, your peace of mind becomes automatic. If you want peace around you then you must pray it into existence. God in many scriptures emphasized the importance of prayer if you want to enjoy peace. In 1Timothy 2:1, He admonished us to pray for kings and all that are in authority so that we may live a quiet and peaceable life. And in Amos 6: 1-7, God rebuked all who were at ease in Zion when things were going wrong and told them that because of that they would go into captivity. When you choose not to pray when you see something small going wrong, know that before long it will become something big that will swallow up any peace you may have. And in Isaiah 32:9-20, God also rebuked the women who were at ease and complacent. He warned them that if they didn't change they would see calamities upon calamities, troubles upon troubles; but that if they would pray and call down the Spirit of God upon them they would see fruitfulness, justice and righteous. And then, the people will dwell in peaceful habitation. What you can't achieve because you are not in the political, economical or social position to do so, you can achieve on your knees. The peace you desire in your family, place of work or nation you can achieve through prayers. Every knee bows at the name of Jesus! What you don't want, you shouldn't just watch; do something about it and most importantly pray about it. Now, prayer is not just saying something to God, it is praying from the heart, backed up with God's word and faith in Him. You may pray for an hour and still not pray, but when you meet with God even for a moment, you will be in touch with Him all through the day. Therefore, target to meet the Prince of peace in prayer, and peace will stay with you all day. Prayer - What is it to a Christian? According to the Bible, there was a time when God and Adam walked together in the garden and conversed as friend. In the back flip cover of the same book, Yancey writes, "If prayer stands as a place where God and Human beings meet, then I must learn about prayer." All human being pray regardless of their beliefs, men pray and have always prayed. History records prayers long before the time of Moses, and the Bible informs us that men shall pray to the end of time, even if it be only to the rocks and mountains. Most of these ancient prayers were not, of course, prayers in a Biblical sense. They were generally offered only in times of emergencies, such as an earthquake, an important battle, a pestilence, prolonged drought, or some other great calamity. They were motivated by fear, often the desire for revenge on enemies; for the Christian concepts of love and concern for the welfare of others appear to be completely absent in some primitive peoples. Their prayers were prayers for themselves and for the destruction of their enemies. Utter selfishness lay at the root of such petitions. Prayer is part of man's nature, whatever his skin. We call attention to this universal practice to stress the fact that prayer is a natural phenomenon common to all mankind. Many non-Christians pray habitually more than do Christians, as witness the Mohammedans and other Eastern religions. Prayer is inborn in man, a part of his nature. Missionaries capitalize on this implanted prayer habit and find it an excellent means to approach to uncivilized people. These people pray already. They need to have their prayers directed to the God of all, the One who made the heavens and the earth. For the Christian, love of God is the true motive that leads him to pray. Fear, hatred of his enemies, selfishness, love of show, find no place in his thinking. He prays when he is in danger and asks God for protection from harm and accidents; he prays when he is sick or facing serious problems; but he has in mind that these are not the primary motives for prayer. The real ground lies deeper. Therefore, we find Daniel, when faced with the decree that under pain of death no one might pray to the God of heaven, "..., he went into his house; and his windows being open in his chamber toward Jerusalem, he kneeled upon his knees three times a day, and prayed, and gave thanks before his God, as he did aforetime". Daniel 6:10. He did not change his practice because of the decree. This illustrates Christian prayer at its best. An appeal to God for help in time of crisis is right and proper. The Bible is filled with examples of this kind of prayer. However, we have to keep in mind that this is not to be the prevalent form of prayer, nor is it of the highest kind. Prayer should not be dependent on a crisis. These incidents reveal that the Lord uses all manner of means to call men to Him. He did that in older times, and He does this today. 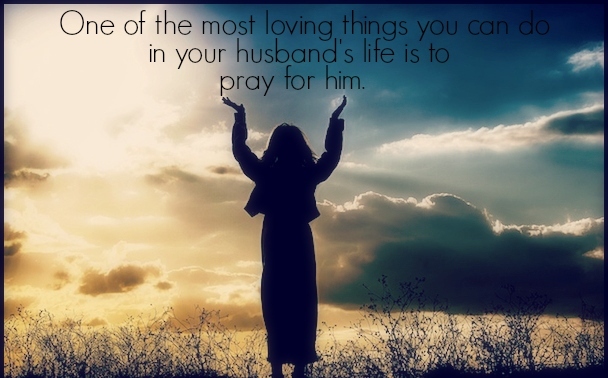 God has many ways to incite men to prayer. The profound issues before the world teach men to pray as well as to think, and God uses them to further His aim. At a time such as this, it is well for the people of God to take stock of themselves. Have they any power in prayer that the world does not have? Are they taking advantage of the power that is at their command? Have they learned to pray? Have they learned to wrestle with god in prayer? And are they finding in prayer their stay and help? "Men ought always to pray." In a special sense, this applies to our present time. Prayer is the highest spiritual exercise of the soul. In its deeper form it passes into communication and fellowship with God, opens the doors to the throne room of the universe, and converses with God as with a friend. In the earthly temple, the Mosaic priest came nearest to God when morning and evening he offered incense on the altar. Likewise, the Christian comes closest to God in his daily devotions, as his prayers ascend with sweet incense of Christ's righteousness to the throne of the Almighty. Some Christians consider prayer a duty to be discharged at stated times to please God. When they have performed their devotions, they rest content that they have done what is required of them. They feel that they have reminded God of what He might otherwise forget or neglect, but to which He will now doubtless give attention. God loves these dear souls who daily call upon Him as a matter of duty; and from heaven, He sends the answer to their prayers when it is most needed. He knows the sincere desire of their hearts and overlooks their imperfect approach. Nevertheless, most Christians pray not as a matter of duty but because they feel the need of communion with their Maker. Some use prayer books and recite the beautifully worded prayers prepared for their use. Others pray extemporaneously, pouring out their soul's desire in their heart language that God understands. They pray for loved ones, for missionaries in far-off fields, for the sick and afflicted, for persecuted ones and those that suffer reproach for the Lord's sake; they humbly petition God for forgiveness for their many shortcomings and for daily strength, and then leave their case with God. God loves to hear them pray. The Bible not only encourages us to pray, but commands it. "... men ought always to pray, and not to faint;..." Luke 18:1 says the Savior. This makes prayer a Christian duty that should on no account be neglected. Nevertheless, to the true Christian, prayer is more than a duty: it is a high and blessed privilege. Paul speaks of love, as a duty when he says, "So ought men to love their wives..." Ephesians 5:28. There is indeed an "ought" phase to love as there is to prayer. However, in both cases the privilege phase far exceeds the duty aspect. No man truly loves his wife considers it his duty to do so. To him it is not a duty or a task; it is a privilege. There are some vital questions that come to mind as we consider prayer. Some doubt that prayer accomplishes anything aside from the reflex influence it has on the one who prays. Does prayer ever change the mind of God and make Him alter His intent? Are answers to prayer only wishful thinking? Is prayer effective in the field of bodily infirmities? Is anyone ever healed of organic difficulty? Are souls saved because we pray? Is real communion with God possible? We shall consider these and other questions as we proceed. It is time that we face the subject of prayer realistically. This we shall do. Greatness and success is a very precious achievement. Some people attained by fighting and struggling to get to the position they are. There was no way they could get there without a dogged determination and hard work, one example in the bible is David. Some other people get to that level by inheritance, these ones did not fight any battle. They simply occupied a great position because of the family they were born into, one good example in the bible is Solomon. Some others get to the position of great success by getting favor and help from someone else, Mordecai is an example of such, he became very great because he was promoted by the king. It does not matter how you get there, either by fighting, inheriting or by receiving favor. All you need is to be successful in whatever you have chosen to do on earth. I pray that the grace of God that makes people rich and adds no sorrow will be your portion in the land of the living. One thing I want you to go away with is this, whether you are born to a great family or not, you too can attain to greatness in life. The truth is that those who achieved great honor and power by their own effort always enjoy self satisfaction. I pray that the heaven will open for you today to empower you with strength and anointing you need to become great in life. The grace of God will come upon you that will make you worthy of the inheritance of the saints in light in Jesus name. God will give you the grace to be favored by those who will help you to accomplish greatness in destiny in Jesus name. God will open to you today a book of remembrance that will attract great blessings to your life in Jesus name. Please pray the following prayer for yourself. 1. Let every good thing that bitterness have destroyed in my life be restored to me today by your mercy oh Lord. 2. Lord help me to have a proper perspective of my life and the events surrounding me. 3. Please LORD, help me to know when to hold on to things, ideas or decision and when to let go. 4. LORD give me an eagle eye so as to be able to locate and recognize my helpers of destiny. 5. LORD, give me discerning spirit so I will be able to see the opportunities that's in adversity and the adversity in any opportunity. Many people ask me about praying. As a spiritual advisor I pray with almost every one of my clients. I do not believe in any religion, but find strength and encouragement from all of the great masters and teachers of the Great Spirit. People always feel a great release when I pray and I would like to lay out what I have found to be the perfect prayer that is simple and easy to do every day. I choose no argument with those of various religious doctrines who oppose these ideas that I put forth, and ask only for the same courtesy in return. I had a visitation with Jesus last year, this was not my first visitation with Jesus, and he laid out to me why this prayer was so important to say every day. No matter what religion or spiritual belief you have here is a wonderful outline of how to pray. You do not have to be a Christian for this to be effective because this prayer is perfect in its simplicity. Remember Jesus was not a Christian. I am spiritual and I do admire many of the teachings of Jesus. I am going to break down each line of this prayer and show you why it's important in its beautiful simplicity. You do not need to use vain repetitions because you think this will get the attention of God. Get alone and pray by yourself because this will give you time to quiet your mind and hear any messages God can give you. Praying in a group is good, but it will not help you get answers that you need or give you the perfect peace of the Divine. God loves having time with you alone. He's always waiting for you and prayers are answered. Prayers are often answered in ways that we did not ask. 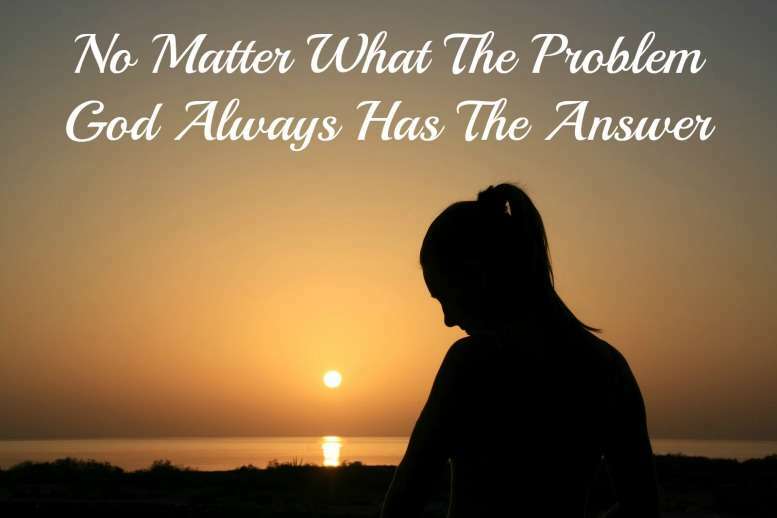 The reason is God's ways are not our ways and His thoughts are not our thoughts. If you pray for just what you need for the day you will start finding openings in your life that you never had before. Be patient and trust that God will take care of you. The Divine Creator knows what you need even before you ask. It's in the asking that the miracles occur. THERE are times and seasons where life is terrible, lamentable, unbelievably painful; tragic beyond previous experience. Times and seasons where we're learning the sheer cavernous depths of seeming death in life. Times and seasons where a life ending precedes a life beginning. Times, prior to, 'when life can begin again'. There is a sanctity in the pain if we take the Lord there with us. Fondly we'll reminisce over such times; but that is destined locale for a time months or years away. Let it come without pining for it. But let us be emphatic in the pining. Allow me to be comforted by your prophets, your apostles, your Job, and your David. Show me in the pain of those biblical exemplars that I am, indeed, in esteemed company. Help me to know your Presence by feeling you present there with me, as I bear these trials of helplessness, hopelessness, travail, and despair. Revive me the day after my despairing. Breathe your Holy Spirit through me, afresh, from within my inner being. Make hope rise inside me. Protect me from further attacks of the enemy. And make me to hope upon your deliverance - that soon, someday very soon, I would overcome this grief. Help me a little more with each passing day to accept the realities that face me. Help me to face these realities with your grace empowering my patient, enduring response. Help me to be still in this crisis. There are many circumstances of life that can floor us. The gentle and therapeutic Presence of our Majesty-on-High is inside us as believers. That sweet therapy of his Presence is constantly available. We must be God-conscious, which is a consciousness of belief that he, Father-Son-Spirit, is with us, indelibly and with Spiritual reality, helping. The comfort of him who comforts us is comfort enough for the moment. And for each moment, hence, faith is in resting in the comfort of the Comforter. Comfort means "with strength," or to strengthen, support or console. The Holy Spirit, as Comforter, breathes life to strengthen us through consolation - meeting us wherever we're at. We cannot lose even in this loss. Comfort is safety and a no-lose situation. We get what we need when we need comfort, knowing that getting comfort from God is what we need. God knows the needs of our moment, and our moments are helped when we accept he will meet our needs. Bring about your sweetest understanding ear, your warmest delight in me, and your cosiest hug. Meet me. Warm me from the inside out. Make these things I pray for, real in me, this moment. In Jesus' compassionate name, I pray, Amen. One day soon hope will return, and, without effort, joy and peace will prevail. And love will again be foundational upon our hearts, where fear, again, finds no place. One day, soon. Tomorrow, even perhaps today. You are our God, my God, and the LORD of all creation. You, and You alone, are the reason existence is, and You, alone, give everything its place and time and space, as only You ordain. You are to be magnified. You are to be exalted. You are our Provider God; You pre-ordain everything to exist for its purpose. I pray, LORD, for Your covenant grace to pervade the place and time and space of those who truly need You today. And we all need You. Yet, there are some who need You especially today. Grace them by Your Presence, in their need, today, LORD. Help that person to know You are with them, in their midst, even today, even now, this moment. Give them a memorable piece of You. Give them what they have never had before. Or give them a remembrance for what was, perhaps years ago, a landmark experience of You. Thank You, LORD, that our deepest need, and Your worthiest provision, is to know You. I pray by Your covenant mercy that You would look especially kindly to the poor today; to those without means of transport; to those who are oppressed; and, to those who find themselves trapped, confused, perplexed, abused, violated, upset, numb, afraid, and especially those who feel depressed. I pray Your emotional and spiritual healing over those who are vanquished of spirit and bereft of soul. I pray even Your anointing becomes to them that precious provision boosting them into new life. For the incarcerated - whether by external authority or their own affliction - that You would open their minds and free them to choose for Your joy in their tumult. I pray for the shallow of heart that they would experience Your depth of expanse. I pray You would set free the captive; bind up the wounds of the broken-hearted; bring the oil of gladness in place of a spirit of despair. I pray perspective be theirs most who need it. I pray for Your special sight - Your glorious perception - to be in the person who reads this prayer. Gracious, merciful, and most holy God, I beseech You in Jesus' name, that You would act upon the heart and cause the mind of anyone who reads this prayer to be renewed. Take them by surprise. Give them a hope that cannot be explained. I pray that the needs of the needy would be known to You by their prayers; that they would pray knowing that You, the God of all creation, is listening and affirming. Here is a prayer for Your worship, for my humility, to express my penitent joys, and to meet the desires of your Being; You're the grace of infinite pardons, but You don't leave me where I'm at. You, who surrounds me with life and love, who enters life with me, who doesn't ever leave me nor forsake me; I am in awe of who You are and for what You've done. You're worthy of the highest imagined and manifold praise on the scaffold of Truth. Before You, O God, I suffer the indignity of being without my peace, because again I have not trusted You more completely than I should. I confess not simply my sin; I also confess my need of You; that in my turning back toward You, that You'd make me warrant the blessings I so often in life receive. From a time of adoration comes a time of thanksgiving, and today, LORD, I give You my hope, in the unadorned thanks of a Prodigal who comes home sheepishly, yet is met warmly. Ever more am I to be thankful, especially when I'm so involved in life that I add a sense of entitlement to it that ought always to be swiftfully repented of. Be mine as I'm Yours, too, Lord. Complete me as You protect me. Purge me of my fearful ways, and help me accept that I am, ever and always, where I should be. Give me the grace to deal with what troubles me. Now that I'm grateful, help me to stay that way. Help me understand the beauty in every experience. And help me to know Your teaching, and the appropriateness for my time in the lessons set before me. I believe in the Power and in the name of Jesus. Do you struggle to pray? Do you wish your prayer life is stronger? Many people desire to pray effectively but don't know how to overcome the weakness they experience while praying. This post gives the solution to this challenge. The importance of prayer cannot be overemphasized. A solid prayer life is the foundation for a victorious Christian life. The enemy is aware of this, which is why he would do everything possible to hinder you from praying. One major way he achieves this is through the flesh. Your spirit may be willing but if your flesh is weak, you will have a struggle to pray effectively. Therefore, the need for you to subdue the flesh becomes very crucial. The flesh wants to sleep when you want to pray. It wants to eat when you are fasting and praying. It wants to do any other thing other than empower your spirit. You cannot subdue the flesh by your own strength. You need divine help to overcome the weakness in your prayer life. 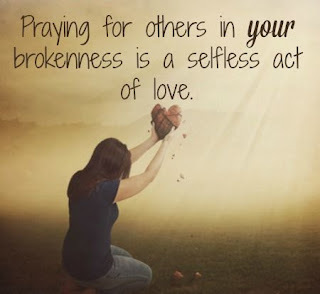 · Help of Jesus - Ask Jesus to help you subdue your flesh so that you can pray well. You can pray effectively when Jesus strengthens you. Jesus prayed and strengthened Peter so he could lead the disciples and spread the gospel efficiently. Peter who was not able to stand for Christ before a maiden was now able to stand for Him before multitudes, including the priests. 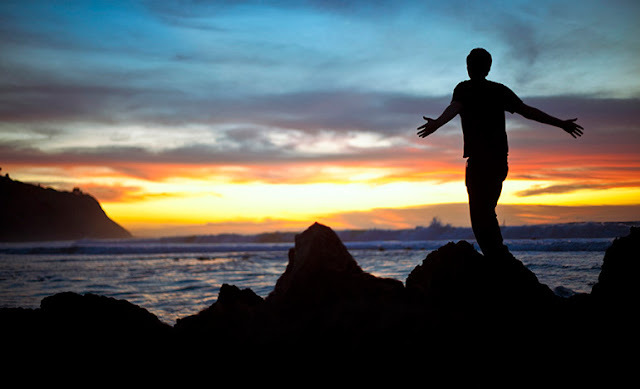 · Help of the Holy Spirit - Ask the Spirit of God to help you in your weakness. The Holy Spirit empowers your spirit to have dominion over your flesh. The twelve disciples of Christ could not pray with Jesus for one hour because of sleep. But after the baptism of The Holy Spirit, they didn't want to do any other thing except to give themselves continually to prayer, and to the ministry of the word. Anything that will not allow you to pray effectively is a yoke and needs to be destroyed. When you apply it in faith, the Spirit of God goes ahead to destroy the yoke. This is a mystery that God has made available for us to enjoy a victorious life. When Saul was anointed the king of Israel, the Spirit of the Lord came upon him and he prophesied with the prophets and was turned into another man. · The Holy Communion - Administer it to yourself daily for strength. The Communion is the body and blood of Jesus broken and shed for us so that we can live like Jesus. The life of a creature is in the blood. When you partake of the communion you partake of the life of Jesus: you are empowered to do what Christ could do, including praying effectively for a long time. The multitudes that believed in Christ continued steadfastly in the apostles' doctrine and fellowship, and in the breaking of bread and in prayers. In conclusion, the weapons given above when engaged will certainly help you to overcome the weakness in your prayer life. For though we live in the flesh, we are not carrying on our warfare according to the flesh and using mere human weapons to fight the enemies of our victorious life. The weapons of our warfare are not physical [weapons of flesh and blood], but they are mighty before God for the overthrow and destruction of strongholds, including those against our effective life of prayer. We are instructed in the Bible to "pray, believing and you will receive". Prayer opens doors for your good. Belief is the key that opens the doors. Align yourself with God, ask for guidance for a successful life and you will have it. One successful thing after another will happen in your life. Prayer is always the solution. Prayer is a wish turned God-ward and God answers you. With God all things are possible. God is all powerful and knows no opposition and is the present help in time of trouble. If this is so-and daily proofs surrounds us-then prayer is the greatest force in all the world. No matter what the problem might be, no matter how great the difficulty or how complicated the matter seems to be, prayer can solve it and bring about a happy and joyous solution. After having prayed, you take whatever practical steps seem indicated, because your prayer will guide and direct your footsteps. Prayer is contacting, communicating, and aligning your thought with the Infinite Intelligence which responds to the nature of your thought and belief. Prayer will bring forth whatever you need and want in your life, if you conform to the laws of your mind purposefully, sincerely, and righteously. Prayer constantly is bringing about the seemingly impossible and healing the so-called incurable. In the history of man, there is no conceivable problem that at some time has not been solved by prayer. People of all ages, all countries, and all religions have believed in the miraculous power of prayer. "God is no respecter of persons" (Acts 10:34) and He is available to all men, regardless of their race, creed or color. There is marvelous protection in Psalm 91. By memorization, constant reiteration and the repetition of the truths contained in Psalm 91 soldiers going off to war or anyone in a hazardous situation have acquired the feeling of being watched over by an Overshadowing Presence. These truths sink down into the subconscious mind bringing about an inner conviction of Divine protection at all times. This is one of the miracles of prayer. If you are bitter toward someone,cynical,do not practice the Golden Rule and or have hatred and envy toward someone else then pray the following prayer during the day and prior to falling asleep. "God's love flows through them, and I wish success and happiness and peace for all of them." If your back is against the wall and you feel there is no way out or a solution, repeat the following prayer many times during the day and prior to falling asleep. "I stand still, and I know there is a solution for through the wisdom of my subconscious mind. I accept the way out now and the happy ending in Divine order." God already knows what we need before we ask. Truly the Bible says,"...Before they call, I will answer; and while they are yet speaking, I will hear." 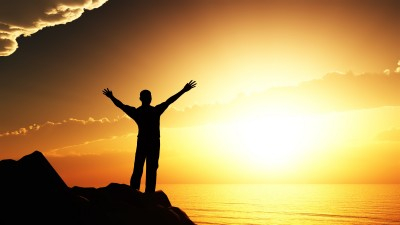 Your Daily Prayer "I know that no matter what the negation of yesterday was, my prayer or affirmation of truth will rise triumphantly over it today. "Today is God's day, it is a glorious day for me. I am full of peace, harmony, and joy. My faith is in the goodness of God, in the guidance of God, and in the love of God. I am absolutely convinced that my deeper mind receives the impress of my present thoughts now, and I am irresistibly attracting into my experience all the good things my heart desires. I now place all the reliance, faith, and trust in the power and wisdom of God within me; I am at peace. Welcome to Spirituality Inside and Out and the Daily Universal Insights. We welcome the whole world into this community of Love, Gratitude and Oneness. I love you. I love you. I love you. FOR WE ARE ALL ONE. A prayer for you as you are all that you are. 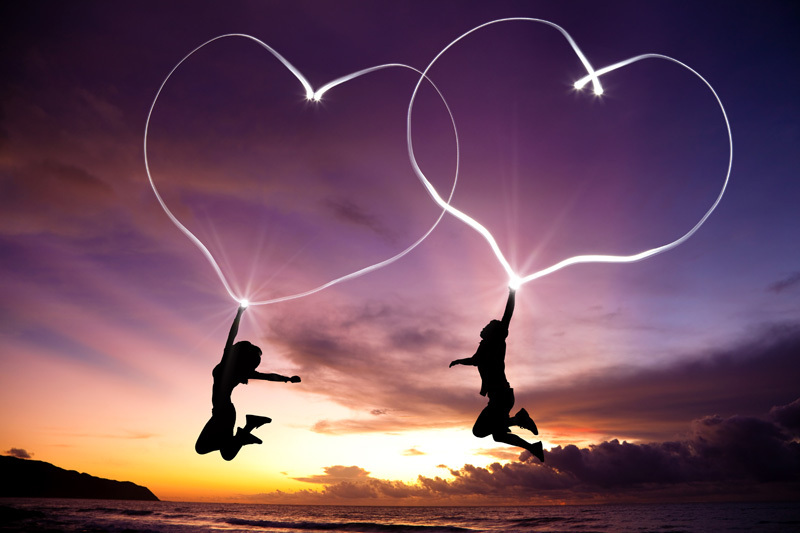 There is no difference who you are as to the way your Heart operates. The pulsating moment with the Divine is right here, right now as you can attune yourself with your Source. With gratitude for all that we are and all that we have, each moment being precious in our Hearts as the ever-lasting presence of the moment of truth inside me and all. What can I do today to express you, Divine Beloved? 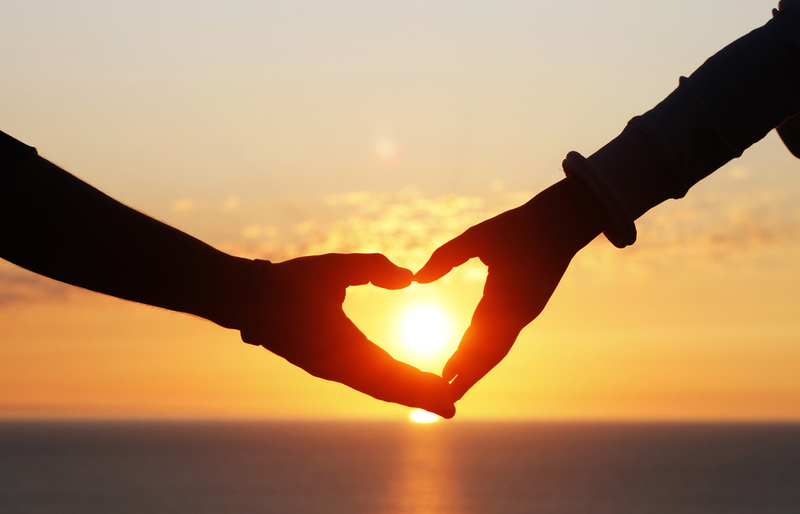 How can I be today to express your love, Divine Beloved? Where can I direct my energy today to express your creativity, Divine Beloved? As I sit still in this moment of connection I am directed to the presence of my Heart as my Heart beats with the Love of God. The Love of God in me as me as you as all. In the here and the now what IS is the presence of Love. What and how I release my Love is up to me and I choose to create an atmosphere of Love in the Now as my thoughts first and then in action. How can I be of service with the Love within me as the foundation of who I am? Oh Divine Beloved, show me the way as I am one with you. 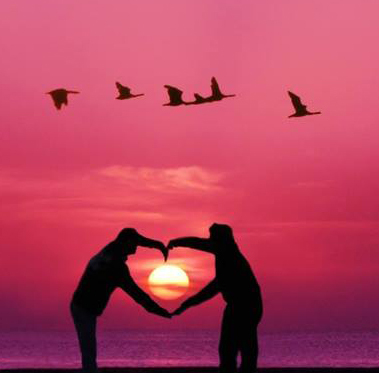 I Love you and I know that you Love me for we are One. Oh Divine Beloved, I am free as I am free of my limitations and I expand my boundaries to donate my Love to my Soul. My Soul being what IS, the presence of the Divine as me everlasting with Light as I am glowing. As I close my eyes I attune to the Light within me and as I let go I can see, sense, hear and feel my Light calling out to me "We are One". I let myself be with my Light and I breathe into my Light and experience my light as me. I breathe again into my Light as I create Oneness inside, I create Oneness outside. I rejoice in the connection of the Oneness of the Souls. Dear Divine Beloved, I Love you and I know that you Love me too. There is never a moment when I'm alone for your Love is everlasting in my Heart and Soul. My Heart and Soul tickles with delight as I breathe into the truth of who I am. I am that I am the Divine Presence of the Allness as me here in the Now. I am honored to be One in this life time with all that Is as this body as me. I am grateful for my mind, body, spirit and soul. I am grateful for all that I experience knowing that as I am called to evolve and learn I am One with you in my Heart and Soul. I Love you Dear Beloved and I know that you Love me too. And so it is. Bless you. Amen and I let it be. Peace, I love you. I love you. I love you. FOR WE ARE ALL ONE. Please feel free to forward and share these Insights with your family, friends, associates, helpers, boss, teachers, students and enemies to create a space of openness to create Oneness. May the love and light of God and the Universe surround, protect and heal you, your loved ones and the planet earth. For our healers and coaches creating Transformation inside and out. For our purposeful creations of delightful and inspirational products. Tribulation tests our identity as Christians Tribulation tests our identity. In the parable of the sower (Matthew 13:1-23), Jesus described several situations. The seed that landed on rocky places did not have much soil. It sprang up quickly, because the soil was shallow. When the sun came up, the plants were scorched, and they withered because they had no root. Jesus said that the one who received the seed that fell on rocky places is the man who hears the word and at once receives it with joy. Since he has no root, he lasts only a short time. When trouble or persecution come because of the word, he quickly falls away. The one who received the seed that fell among thorns is the man who hears the word, but the worries of this life and the deceitfulness of wealth choke it, making it unfruitful. The seed that fell on good soil produced a good crop. By implication, that seed that fell on good soil stayed connected to the source of its life and was not destroyed by trouble, persecution, the worries of this life, or the deceitfulness of wealth. When we deal with tribulation as we should, it authenticates our true identity as believers. Tribulation tests our faith "These [trials] have come so that your faith of greater worth than gold, which perishes even though refined by fire may be proved genuine and may result in praise, glory and honor when Jesus Christ is revealed" (1 Peter 1:7). Tribulation tests our sense of purpose When I was in my first year of medical school, I was about one minute late to histology class two or three times in a row. Our professor approached me in the laboratory and notified me that my tardiness reflected on my "sense of purpose." I was never late again, because I realized how it would reflect on my character. As it says in James, "Blessed is the man who perseveres under trial, because when he has stood the test, he will receive the crown of life that God has promised to those who love him"(James 1:2). Tribulation tests our obedience "The reason I wrote you was to see if you would stand the test and be obedient in everything" (2 Corinthians 2:9). We are tested to teach us to rely on God "We do not want you to be uninformed, brothers, about the hardships we suffered in the province of Asia. We were under great pressure, far beyond our ability to endure, so that we despaired even of life. Indeed, in our hearts we felt the sentence of death. But this happened that we might not rely on ourselves but on God, who raises the dead. He has delivered us from such a deadly peril, and he will deliver us. On him we have set our hope that he will continue to deliver us, as you help us by your prayers. Then many will give thanks on our behalf for the gracious favor granted us in answer to the prayers of many" (2 Corinthians 1:8-11). We are tested so that it will go well with us "He gave you manna to eat in the desert, something your fathers had never known, to humble and to test you so that in the end it might go well with you" (Deuteronomy 8:16). "No, I beat my body and make it my slave so that after I have preached to others, I myself will not be disqualified for the prize" (1 Corinthians 9:27). "Examine yourselves to see whether you are in the faith; test yourselves. Do you not realize that Christ Jesus is in you unless of course you fail the test? And I trust that you will discover that we have not failed the test. Now we pray to God that you will not do anything wrong" (2 Corinthians 13:5-7a). "They claim to know God, but by their actions they deny him. They are detestable, disobedient and unfit for doing anything good" (Titus 1:16). "But land that produces thorns and thistles is worthless and is in danger of being cursed. In the end it will be burned" (Hebrews 6:8). Consider what 1 John 2:19 says about some who left the fellowship: "They went out from us, but they did not really belong to us. For if they had belonged to us, they would have remained with us; but their going out showed that none of them belonged to us." As I study these concepts, I can only come to one conclusion: Salvation is a gift from God, but if your life does not show evidence of God working in it, you likely never received the gift. Many Christians have either lost part or all of their faith in the Lord as a result of getting hit with some severe torpedo shots. And unless you have a full understanding as to why God will sometimes allow bad things to happen to good people in this life, you can have your personal faith levels in the Lord shaken to its very core depending on the severity of the storm cloud that may have just struck you. The Bible tells us that God’s people can perish for having lack of knowledge – and not having the right kind of knowledge to fully understand why bad things can even happen to good people in this life, especially to Christians, can cause you to perish in your own personal relationship with the Lord if you ever end up losing your faith in Him as a result of not being able to fully understand why He may have allowed some severe adversity to hit you in the first place. Per the other articles we have in the Spiritual Warfare section of our site, I believe that you can learn how to keep some of the adversity that may strike you in this life away from you if you can learn how to properly plead the Blood of Jesus for deliverance and protection, along with learning how to walk with God’s anointing. The Bible tells us that we have to learn how to become good soldiers of Jesus Christ. If you can learn how to become a good soldier of Jesus Christ and learn how to walk with God’s anointing in your life, then you can either keep a lot of these storm clouds from ever hitting you in the first place, or you can quickly defeat them once they do come knocking at your door. However, as a result of living in this fallen and cursed world, even the best of God’s true soldiers will still have to face a certain amount of conflict and adversity in this life from time to time. There is simply no getting away from it. And until we get the New Heaven and the New Earth after the millennial rule of Jesus from the city of Jerusalem, the curse of Adam and Eve will still continue to stay in place on this earth, and as a result, we will all have to face a certain amount of storm clouds in this life – with no exceptions to this cold, hard, brutal fact and reality. We all want God to answer our prayers. We believe in the power of prayer, but when it comes down to our own individual lives and our own problems, we often don't have the faith to believe God will answer. The times we are living in are difficult. We are often trapped by our unbelief and fear, but God is preparing us for the end-time harvest. He wants to enlarge our territory. He wants to bless us with increase, because His nature is to care and bestow divine favor on us. We are the ones who limit Him because of our lack of trust and our fear of stepping out in faith. The truth is that the things we do for God should be outside of our own ability and should be trusting in His supernatural ability. When we back away from dependence and trust in God, we are not living by faith. He wants us to trust and obey His Word. He wants us to be strong and courageous. We need to be willing to attempt things big enough that unless God's steps in, we are sure to fail. This is the kind of trust and dependence He is looking for in our life. We need not be shaken. He can break through every obstacle. He is the God of the impossible! Lord, I thank You that You are the God of the impossible. You can do anything. I want to trust in Your ability and not my own. Teach me to see difficulties in my life from Your perspective. Help me to focus on You and Your power. I want to be like Joshua and Caleb who believed in a good report and focused on You even in hard circumstances (Numbers 14:7-9). My responsibility is to carefully read, trust, and obey Your Word. Today I bring before You this difficulty in my life [Name a hard situation you are right now facing]. Help me not to fear but to trust You in this situation. I declare my faith in Your ability to fulfill Your promises to me. You will fight for me and win the battles in my life. You are mighty, powerful, righteous and true. I have nothing to fear with You on my side. I will be strong and courageous even in hard times. I will not be terrified or discouraged, for the Lord my God will be with me wherever I go (Joshua 1:9). You will never leave me or forsake me (Joshua 1:5). I do not need to figure everything out. You already know the best plan for my life. I will not try any man-made method to do only what You can do. Show me Your supernatural power. Teach me how to walk by faith and pray breakthrough prayers. I choose to have faith in Your ability to break through every obstacle in my life. Just like Joshua, You will give me the land and every place where my feet step (Joshua 1:3). “Through you we push back our enemies; through your name we trample our foes. I do not trust in my bow, my sword does not bring me victory; but you give us victory over our enemies, you put our adversaries to shame. In God we make our boast all day long, and we will praise your name forever” (Psalm 44:5-8). “Lord, you have assigned me my portion and my cup; you have made my lot secure. The boundary lines have fallen for me in pleasant places; surely I have a delightful inheritance. I will praise the Lord, who counsels me; even at night my heart instructs me. I have set the Lord always before me. Because he is at my right hand, I will not be shaken. Therefore my heart is glad and my tongue rejoices; my body also will rest secure, because you will not abandon me to the grave, nor will you let your Holy One see decay. You have made known to me the path of life; you will fill me with joy in your presence, with eternal pleasures at your right hand” (Psalm 16:5-11). In Jesus name, amen. "Faith does the impossible because it lets God undertake for us, and nothing is impossible for God. How great - without qualification or limitation - the power of faith is! If doubt can be banished from the heart and unbelief is made a stranger there, what we ask from God will surely come to pass. Prayer throws faith on God and God on the world. Only God can move mountains, but faith and prayer move God." Deuteronomy 4:34 Or has any god ever attempted to go and take a nation for himself from the midst of another nation, by trials, by signs, by wonders, and by war, by a mighty hand and an outstretched arm, and by great deeds of terror, all of which the LORD your God did for you in Egypt before your eyes? Deuteronomy 7:19 the great trials that your eyes saw, the signs, the wonders, the mighty hand, and the outstretched arm, by which the LORD your God brought you out. So will the LORD your God do to all the peoples of whom you are afraid. Deuteronomy 29:3 the great trials that your eyes saw, the signs, and those great wonders. 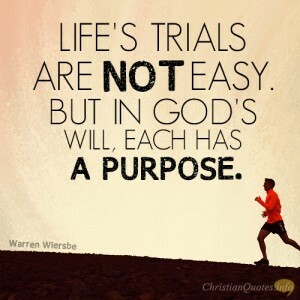 Even when it seems like your world is falling apart, God has a purpose for your trial. Acts 14:22 strengthening the souls of the disciples, encouraging them to continue in the faith, and saying that through many tribulations we must enter the kingdom of God. Deuteronomy 4:30 When you are in tribulation, and all these things come upon you in the latter days, you will return to the LORD your God and obey his voice. Mark 4:17 And they have no root in themselves, but endure for a while; then, when tribulation or persecution arises on account of the word, immediately they fall away. Romans 8:35 Who shall separate us from the love of Christ? Shall tribulation, or distress, or persecution, or famine, or nakedness, or danger, or sword? Joshua 7:25 And Joshua said, “Why did you bring trouble on us? The LORD brings trouble on you today.” And all Israel stoned him with stones. They burned them with fire and stoned them with stones. 2Samuel 14:5 And the king said to her, “What is your trouble?” She answered, “Alas, I am a widow; my husband is dead. Sometimes people think that trials are the same thing as temptations. These are not the same thing. What is the difference between a “trial” and a “temptation”? According to the dictionary, a trial is “a test of faith, patience, or stamina by suffering or temptation.” A temptation is “an enticement to do something wrong by promise of pleasure or gain.” It is “the act of tempting, especially to evil.” Temptation comes from evil desires inside us, not from God. It begins with an evil thought and becomes sin when we dwell on the thought and allow it to become an action. People who live for God sometimes wonder why they still have temptations. Does God tempt them? No. God tests people but he does not tempt them by trying to seduce them into sin. But God does allow Satan to tempt people in order to refine their faith and help them grow in their dependence on Christ. Don’t ever confuse temptation with God’s testing your faith (trials) as a way to strengthen it. Trials will indeed come our way. If you are not facing a trial right now, Praise God! But be ready because one is sure to come your way. God never allows us to go through more than we can handle. Recently, God has handed me some pretty big challenges. Challenges, one might question why we are given some of the toughest situations in our every day life. Your life is flowing along smoothly, things are great, one couldn’t ask for more. You tell people “My life could not be any better. God really is taking care of me.” You start to get very comfortable on easy street, so comfortable that you start slacking in three of the most vital importance’s, of one’s life... staying in the word, church/fellowship and prayer. You see, in my case my life crumbled a year and a half ago. After many years of working hard to keep things together, protect my children and provide a good family life for them. One in which we did not always have. But, for years I thought that Gods plan for me was to keep it together no matter the cost or what kind of destructive effect it had on my life. At that time I was in the word every day, I prayed constantly and was very involved in my church. I found myself screaming at God questioning him and then begging his forgiveness for subconsciously allowing Satan to have an inch of control. I constantly had to remind myself to refocus, that God had a purpose for my suffering and that he had a better plan for me. I remembered my faith and knew that he was just waiting on me. Waiting on me to ask for him. His hope for me was to stop trying to live my life alone, taking care of everyone around me, avoiding any help that I might need and thinking that I could do it myself. Suddenly, there was such a peace surrounding me, a warmth that radiated through me. And then I heard him. He told me to surrender to him, to give him it all. To lay it at his feet. Most of all I can remember him telling me to be still, know that he is God, listen and wait. It was amazing at how different I felt at that very moment. Such a weight had been lifted from my life. Slowly, things began to brighten. I was praising God for saving me once again. The sudden changes in my life were amazing. I had gained my strength back, only this time I became not only a stronger, more faithful Christian, I became the strong individual that God had intended for my life. My life started to get easier. The tears dried up and I was facing things in my life. Facing them with confidence and a strength that I never thought that I had. I started to put my life back together again. God is merciful and good. He knows us inside and out. And his plan for us is the ultimate plan for anyone’s life. So, I started to get comfortable again. Thanking God everyday for the many blessings in my life. For my peace, my children, Scott, for my life. Even though I was in God’s word, trying to walk in the paths that he was leading me I began to get back in that “comfort zone”. And before long, my life started to shatter once again. My health was failing, my job was suffering because of my health and the problems of the past began to come back to haunt me once again. I found myself re-evaluating myself in wonder as to where my weaknesses lay. And the answers were quite clear. I had to let go and let God. You see, when we face darkness in our lives we sometimes forget that there is a comfort and a peace that is there waiting for us if only we open our hearts to receive it. Facing life’s trials and tribulations is a mysterious component of our lives that only God understands. I reflect on a passage from 1 Peter when he speaks to a group of Christians who are suffering their faith. Peter reminds them how much Jesus suffered. Jesus suffered for us that we might have a life of faith and peace. In 1 Peter he tells us that through our faith we are shielded by God’s power until Jesus returns again. He tells us that while we rejoice in this we may have to suffer in all kinds of trials. He tells in 1 Peter 7 “These (sufferings) have come so that your (our) faith - of greater worth than gold, which perishes even though refined by fire - may be proved genuine and may result in praise, glory and honor when Jesus Christ is revealed.” Jesus Christ suffered and died for us so that his glories would follow. 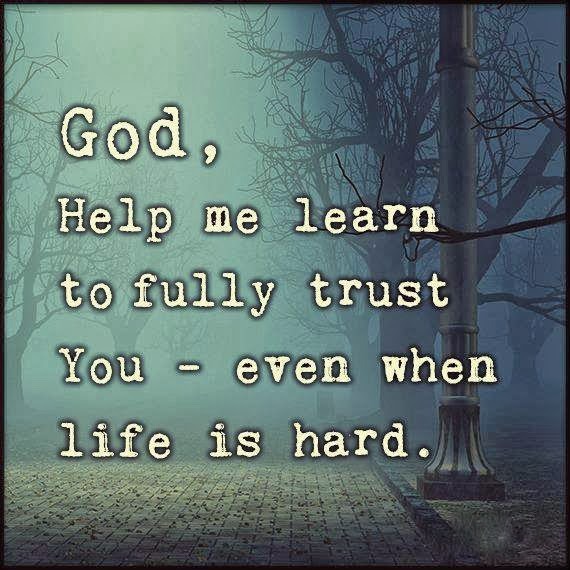 We need to trust God. We need to be still and listen to God. He is not going to tell us anything except for at his appointed time. You might ask when? There is a price to pay for every privilege. Life will not always be fun. One cannot go from dating to marriage without struggle. We cannot go from our old ways to a reborn Christian without struggle. We are to enjoy the season that we are in. Enjoy the journey. When we worry, we cannot enjoy life. Allow God to take care of you. Trust in him and believe in him for all things. John 7 tells us that we all might think that the timing is always right, but Jesus told those at the feast of the tabernacle that “The right time for me has not yet come, for you anytime is right.” If we take a look at our lives, our expectations of everyday Jesus was right. 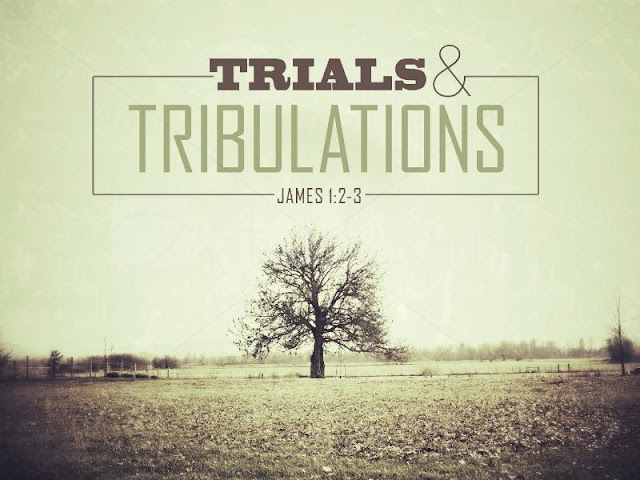 Through trial and tribulation we are faced with the challenges that God has set before us. I know that I am guilty of planning first then praying afterwards. This is not God’s plan for us. He wants us to pray first and then plan. To learn to be sensitive to grace. By being sensitive to grace, laying it in the Lord’s hand and then allowing him to do the work, we are filled with peace and enjoyment. Let’s face it, outside of grace, we are miserable. Am I right? It does not work when God is not in it. It ultimately has to be in God’s timing, not ours. In times of trial and tribulation we must remember that God will not be late. He may never be early, but he will not be late. By trusting in him we find that God’s timing is always on time. Trust God for the right time in your life. When you face your trials in life take a look at those around you. The key to peace about one’s suffering is to put your problems into perspective. Look at the problems that you have, look at those around you and you might just find that you are thankful for the blessings that you have. So, my friends I leave you with these thoughts to ponder on..... Is it not better to cooperate with God and wait for him. Is he not waiting on us? Should we not remain stable, not get frustrated thus distracting us from Jesus? We should stay focused. Do we not tend to spend our lives running around putting out Satan’s fires? We need to attend to God’s business and he will then attend to ours. I feel that until we can learn to be happy where we are at, we cannot and will not get to the next place that God wants us to be. We need to have a better attitude and learn how to deal with the difficult things that God gives us. If we learn to have the victory during trials and tribulations we can be victorious in God’s almighty grace. Now isn’t that something to give us a hope. A hope of the unknown? A hope that no matter how hard life is at times, God is still right there beside us waiting on us to give it to him. So often people say to me “How can your faith be so strong with all that you have gone through and continue to go through?” My friends, I tell you that no matter how much it hurts and how many times I ask the question why, my faith carries me through. I don’t like what I have to face in life at times, but I do know that if I remain faithful, God will bless me in the end. He finds a way to bring back my focus on what his plan is for me. He wants me to be victorious in him and in carrying my faith and love and belief for him, I ultimately am victorious. I am becoming the righteous woman that he has set out for me to be. As I face my uncertainty and fears in life I know that I can face them with the understanding that if I just allow God to take it from me, to trust in him that I can face anything. I leave you with my love and with this poem that my dear friend gave to me last year in one of the worst trials that I ever had to face. It is a poem that I will read every day for the remainder of my life here on this earth. The words are words that bring me to the peace that God wants for my life. Remember to be still my friends and know that he is God. And that he loves you so very much and will always be there just waiting..... Never ever forget to wake each day thanking God for the blessings that he bestows upon your life You might just find your day a little more peaceful! because he is my friend. “My child” He said, “What could I do? More and more it seems that suffering and hurt are prevalent everywhere we look. Those poor, innocent people that were murdered at a movie theatre in Colorado on July 20, 2012 are just one of the many tragedies in the lives of our fellow man today. I think now more than ever, we need to stand as Christians and unite as one body and pray for our country. Satan is so easily using people for his wicked agendas. This is not a surprise, but it still hurts. If you are hurting right now while reading this, know that your tender, loving Father has His arms open and He is always ready to hold you if you just let Him. Many people that are hurting today are cursing God and some believers have abandoned God. They did not have Christ as their solid foundation. It is so important to have a strong faith through the best of times so when the winds blow, we will not be moved. Trials and hard times come for a reason and that is to grow closer to our Father. So, how can we praise Him during the darkest hours? Let us look at scripture for clear examples. Timothy 2:8-9 says, remember Jesus Christ, risen from the dead, the offspring of David, as preached in my gospel, for which I am suffering, bound with chains as a criminal. But the word of God is not bound! Remembrance of Christ and His death at Golgotha needs to be the center piece through which we praise God in the hard times. When we suffer, we can remember that He suffered, and His suffering gave us freedom! This is one reason some leave the faith. They forgot what even brought them into God’s loving hand. Praise be to God, our Almighty King that gave us the final sacrifice to atone for our sins! Trials and hard times come for a reason and that is to grow closer to our Father. Every time we connect with God in prayer, we are praising Him because we are acknowledging our need to set our burdens on His strong shoulders. Isaiah 25:4a says, for you have been a stronghold to the poor, a stronghold to the needy in his distress, a shelter from the storm and a shade from the heat. These are things we can praise Him for while we are praying! He takes care of His children! Even in the darkest part of the storm, He is there as a stronghold to keep us standing against the crashing waves and raging winds. A man on his knees in prayer can stand before any tragedy. When you read Psalms, you can find so many verses about God’s children singing praise even in the midst of hard times. David writes in Psalm 142:4b-7, no one cares for my soul. I cry to you, O Lord; I say, “you are my refuge, my portion in the land of the living.” Attend to my cry, for I am brought very low! Deliver me from my persecutors, for they are too strong for me! Bring me out of prison, that I may give thanks to your name! The righteous will surround me, for you will deal bountifully with me. This particular Psalm was a written prayer, but it could just as well be sung. So many songs today are written straight from the Psalms. One particular song that has always touched my heart on this issue of hard times and suffering is “There Will be a Day” by Jeremy Camp. This song always brings tears to my eyes. Anything that we do as Christians that focuses our time on God brings Him glory and praise. When we look to His word for healing and guidance, we again are telling God that we need Him and we praise Him for His sovereign nature in all circumstances. In Hebrews 4:15-16 it says, for we do not have a high priest who is unable to sympathize with our weaknesses, but one who in every respect has been tempted as we are, yet without sin. Let us then with confidence draw near to the throne of grace, that we may receive mercy and find grace to help in time of need. This is a passage of love that speaks to all who are hurting. Jesus was tempted in every way so we can be completely firm in our belief in Him. My fellow brothers and sisters, write these verses on your hearts. We can have confidence in our Father in all circumstances. Stay in the word! It can heal the broken hearted. Fasting is an outlet that provides a spiritual and physical reliance on God. Fasting is not set on any particular facet. Many people fast from food for an extended amount of time, but fasting really involves giving up anything that means a lot to you in order to spend time with God instead. This is a precious way to praise Him. When you fast you stop “me” and focus on Him. I have had the opportunity to participate in the 30 hour famine a few times and I cannot describe the feelings of reliance that I had personally with God in the final 10 hours when food sounded amazing and I gave my cravings to Him instead. He has sustained me every time I have fasted. The spiritual bond always grows with fasting because God is feeding that bond as you rely on Him. Forgiveness always reflects praise on the Father. We forgive out of obedience to Christ. We forgive because it is always the right thing to do. There is real spiritual maturity and growth when we can look at specific people that have wronged us personally and forgive them. This is because sin always comes from the devil and not from the individuals themselves. There is massive spiritual warfare fighting for us every day. Satan’s legion of demons are always hunting. It is our job as believers to rebuke them with scripture and always forgive those who trespass against us. The true fault is always against the devil and his wicked schemes. Even Christ on the cross asked His Father to forgive those crucifying Him(Luke 23:34). May we all strive to be like that! Praise be to our Sustainer in all circumstances!Looking for some more music related articles? 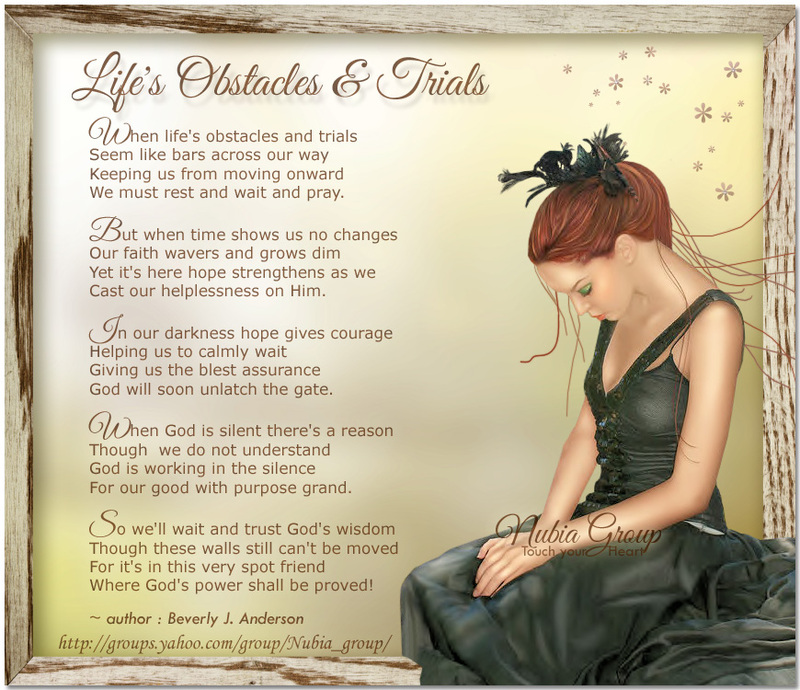 How do you react when you face trials and tribulations? Do you give up or do you turn to God and the Bible? Trials are something we all will face as Christians, so learn to get through them by keeping the faith and praying. It IS easier said than done, that's for sure. We can SAY that we just need to pray to find our way through trials, but it is still going to be hard. Think of every awful thing that happened in your life. Every single instance was painful and maybe you are still not "over it." What can make a different is praying to God for wisdom, for healing and for love. No matter what hardships you are facing, remember that God loves you. He gave up his only Son for you! So pray for grace and pray for strength - each one of us can make it through each one of our trials, we just need to be strong. With God, all things are possible. This is an important fact to remember. If you want to learn more about making it through your worldly trials, read the Bible verses on trirals below. And God Bless you. Job 5:19 He shall deliver you in six troubles: yes, in seven there shall no evil touch you. Isaiah 38:17 Behold, for peace I had great bitterness: but you have in love to my soul delivered it from the pit of corruption: for you have cast all my sins behind your back. Matthew 19:26 But Jesus beheld them, and said to them, With men this is impossible; but with God all things are possible. John 16:33 These things I have spoken to you, that in me you might have peace. In the world you shall have tribulation: but be of good cheer; I have overcome the world. 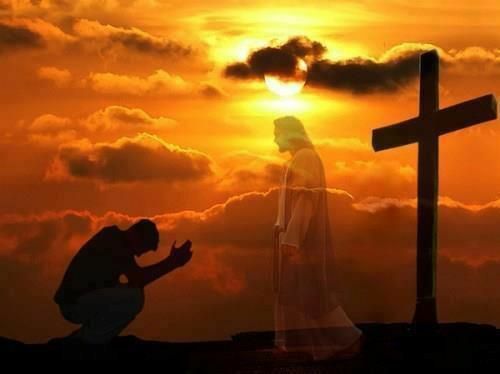 2 Corinthians 12:9 And he said to me, My grace is sufficient for you: for my strength is made perfect in weakness. Most gladly therefore will I rather glory in my infirmities, that the power of Christ may rest on me. Hebrews 2:10 For it became him, for whom are all things, and by whom are all things, in bringing many sons to glory, to make the captain of their salvation perfect through sufferings. James 1:12 Blessed is the man that endures temptation: for when he is tried, he shall receive the crown of life, which the Lord has promised to them that love him. Jude 1:6 And the angels which kept not their first estate, but left their own habitation, he has reserved in everlasting chains under darkness to the judgment of the great day. ROMANS 12:12 Rejoicing in hope, patient in tribulation; continuing instant in prayer. Yes, trials, and tribulations will come in our lives,but with prayer as the believer, we are to conquer the trials and tribulations. We may express our trials verbally or emotionally. All is needed from us is Prayer. As the saying goes, shut up and pray. While on earth, we will face problems, difficulties, troubles, tests, traumas, ordeals, sufferings, and pain. Nevertheless, the believer has an overcoming resource. He can conquer the trials of life by doing three critical things. 1. You are to rejoice in hope. Your hope is God - God's presence, concern, and care. As a believer, you know God will do one of two things: either remove the trial or deliver you through the trial. You know you don't have to go through or face trials alone, that no situation is hopeless. You, are the eternal optimist: your hope is in the eternal God. Therefore, you not only hopes in the delivering power of God,but you joy and rejoices in the hope God has given you through prayer. Read 1 Th. 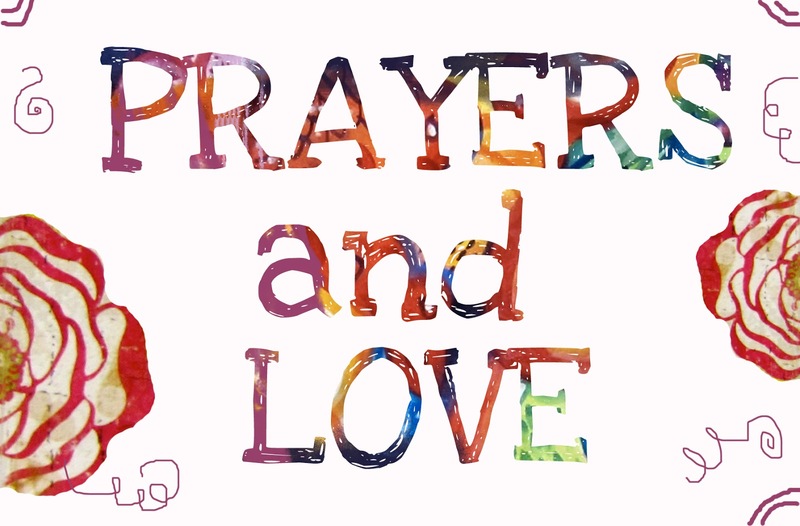 5:17 (pray without ceasing), James 5:16 (pray one for another), Luke 11:1 (teach us to pray). 2. The believer (you) is to endure trials. The word "patient" means to endure, remain, persevere, abide, bear up bravely. You actually experience a surge of fortitude from Christ when trials confront you. Read Ph. 4:13 ( I can do all things through Christ which strengtheneth me) (Eph. 3:16 (That he would grant you, according to the riches of his glory, to be strenghtened with might by his spirit in the inner man. 3. You are to continue in Prayer. The phrase "continuing instant" means to give constant attention to; to be devoted and attentive to; to give unceasing care to; to wait stedfastly upon, to persevere. Very simply, you as the believer,overcomes trials by giving constant attention to God, and waiting upon His delivering power. You no matter what, stays in constant communion with the Lord, Stay in prayer. Thank you all for looking at our Blog! ShutUpAndPray.org have a lot to offer you. Sharing with the body of Christ, What I use to get me out from under life strong hold of debt, depression, lack etc. Shut Up and Pray!